As benchmark interest rates in the U.S. rise and the pace of corporate earnings growth slows, Moody’s Investors Service warned Friday that an unprecedented number of corporate credit ratings could be added to the “junk” pile. Moody’s said the dollar value of U.S. corporate bonds outstanding rated at its lowest investment-grade rung of Baa rose to a record $2.83 trillion in the third quarter, topping the $2.62 trillion in single-A corporate bonds and the $629 billion in outstanding bonds rated Aa or higher. Within the Baa rung, the dollar amount of bonds rated Baa 3—Moody’s lowest investment-grade rating—ballooned by 140% from the fourth quarter of 2007 to a record $705 billion in 2018’s third quarter. Read more about Moody’s ratings. Perhaps more significantly, Baa 3-grade corporate debt outstanding reached an “unprecedented” 56.8% of speculative-grade, or “junk,” high-yield corporate bonds outstanding. By comparison, the ratio of outstanding Baa 3-rated bonds to high-yield bonds was 32.5% before the 2008-2009 financial crisis, 36.9% before the 2001 recession and 22.2% before the 1990-1991 downturn. “All else the same, investment-grade bonds rated Baa 3 are at the greatest risk of incurring a fallen-angel downgrade,” John Lonski, chief economist at Moody’s Capital Markets Research wrote in a note to clients. “Fallen angel” refers to a bond that is downgraded to junk from investment-grade. “Thus, from the perspective of dollar amounts outstanding, the U.S. investment-grade corporate-bond market is now riskier than it was before each recession since 1981 and possibly all prior downturns through the late 1940s,” Lonski said. To reflect that risk, the yield on composite long-term Baa industrial company bonds rose to 202 basis points (2.02 percentage points) above comparable yields on Treasury notes on Nov 14. See Bond Report. High-yield bonds were hit even harder recently, amid concerns over a potential surge in supply as shrinking corporate earnings lead to a jump in fallen-angel downgrades. The spread over Treasurys of a composite speculative-grade bond yield jumped to 415 basis points on Nov. 14 from 371 basis points a week earlier. The selloff in GE bonds isn’t isolated, tweeted Scott Minerd, Guggenheim Partners chairman of investments and global chief investment officer. “The slide and collapse in investment grade credit has begun,” Minerd tweeted. Investment grade corporate debt has dropped more than 3.5 percent so far this year and is on track for its worst year since 2008, when it lost almost 5 percent. The market fell by about 1.5 percent last month, its biggest October loss in a decade. The selloff in GE is not an isolated event. More investment grade credits to follow. The slide and collapse in investment grade debt has begun. Rising rates have hammered investment-grade debt amid growing concerns about credit quality in the BBB rated tier. The recent equity and oil slumps, Cboe Volatility Index spike and rising concerns about trade wars, Brexit and Italy also pressured junk bonds, which are still positive for the year, despite a big loss in October. It’s not just denizens of high finance on Wall Street that would lose if the epicenter of U.S. credit trembles, the aftershock would also hit Mom and Pop. Morgan Stanley strategists modeled the economic fallout wrought by tumbling prices for some of the hottest debt in Corporate America: those rated BBB. 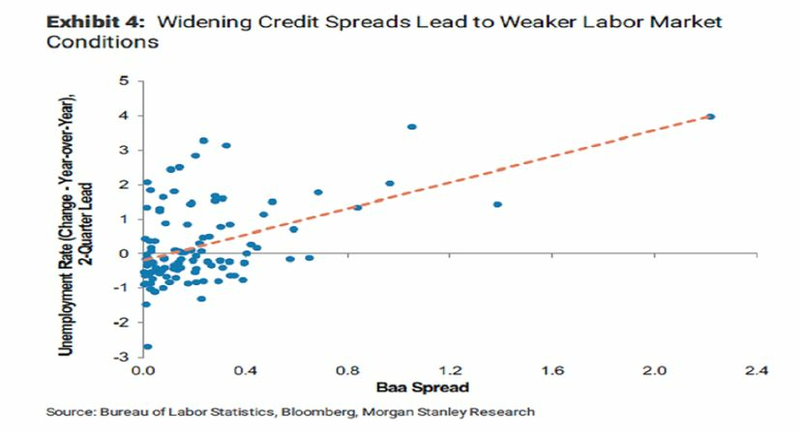 A sustained 10 basis-point widening in BBB spreads would spur a 0.3 percentage point reduction in growth while the unemployment rate would rise by 0.15 percentage point, all else being equal, according to the study published this week. “The risk bears watching as a sustained tightening in corporate credit conditions can create strong headwinds for economic activity,” economists including Robert Rosener wrote in a report. 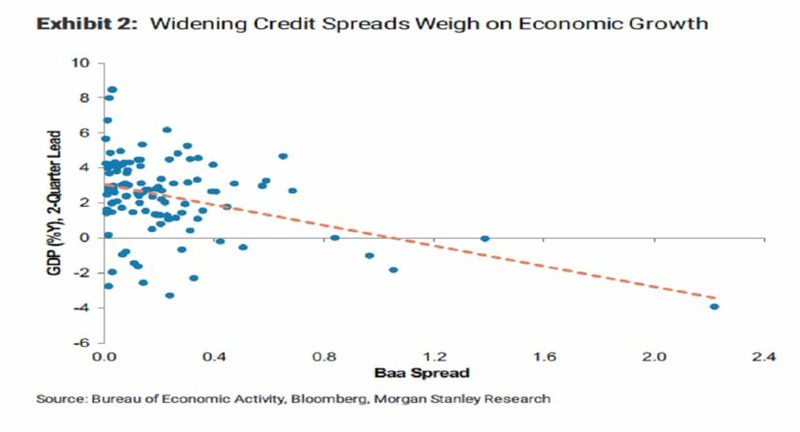 Morgan Stanley used as its sample set the $2.5 trillion of bonds rated BBB, which make up about half the investment-grade corporate debt market and now seen as a hotspot for leverage and downgrade risk in a recession. Spreads for the swathe of borrowers Morgan Stanley looked at have surged almost 20 basis points this month to 161 basis points, the most since 2016. All told, a sustained 100 basis-points increase in BBB premiums over the course of a year is the equivalent to a 62 basis-point hike in the benchmark federal funds rate, it said. The conclusion offers food for thought for Federal Reserve officials on the macro impact of tightening financial conditions.